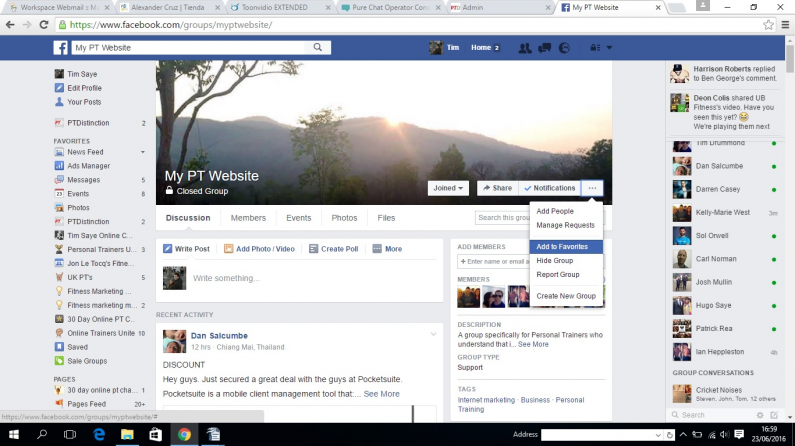 At PT Distinction we've got hundreds of members through Facebook Groups and we don't even have a group of our own! Here's how you can get yourself many, many online clients from other peoples Facebook Groups whilst being helpful and an all round decent person. This client getting method is highly effective and completely free. The search box will bring up a number of options, look for groups that have at least 1000 members then click on the group. This will take you to apply to join the group. Once joined you can have a good look at the group content. Many groups are just full of spam and adverts, leave these ones straight away, they're a waste of your time. Look for groups with good interaction between members. This shows it is an active group and that the admins like participation and tips from members of the group. Find and join as many of these groups as you can find in your specific niche. Once you've joined a group and selected it as one that you will become active in go to the 3 dots at the top right of the page and add it to your favorites (see image below). This means you will easily be able to find this group and keep track of its activity. The first thing to do when entering a new group is to read the group rules, these are right at the top when you login on any computer. Make sure you abide by the rules as getting kicked out or falling foul of the admins does you no favors at all. Do a little research on the admins of the group and find out a little about them (Googling them usually does this nicely), you can also enter their name in to the group search box (see image below) and all of their posts and comments will come up. From this research you can find out what they're selling themselves (Yes, they are always selling something!!) and what opinions they have on certain subjects. If they're selling similar stuff to you be careful how you operate in the group! Do not put up links to your stuff..... 9 times out of 10 you will get kicked out. Offer Help, Help and More Help! Look through the group and find questions that you can provide great answers too. Then answer these questions in the most helpful way you can. Give all that you can and hold nothing back. You will notice that every time you comment on a post that post gets boosted to the top of the group..... This is gold for you..... I will show you why further down the page. Moving forward your aim should be to be the first to comment on each post you comment on. This is not essential but the first comment gets seen and read the most. This means that if you consistently offer help and useful advice your words will be seen. Your comments and answers are potentially seen by everyone in the group. When creating answers you should bare this in mind. What I mean by this is always answer the question correctly and to the best of your ability but also answer it for everybody in the group. This is advice for all group members not just for the person asking the question. The more likes you get on your comments the better, as this gives you great credibility and provides social proof of your expert status. As you get known and liked by the group start to add a full disclosure statement at the end of your comments. This shows you are honest about who you are and that you are upfront about the fact that you may wish to pick up clients from this group. It also lets group members know that if they are looking for an online trainer you are the man to go to! Your full disclosure statement should read a little like this..... (Full disclosure, I run [enter your website] and specialise in............ I help people with this every day). As you feel more comfortable in the group and you find out exactly what the members need help with you can start writing your blogs around the key information that they need. This is fantastic for your writing as it is an easy way to ensure that you are talking your target markets language. Once you've created a blog that will help members of the Facebook group take a shortened version and post it in the group with a relevant image (you can get free images and edit them at www.canva.com ). Remember to add your full disclosure statement at the bottom as this works as a very honest way to get people to check out your website. From this point on you simply have to be consistent. Aim to help someone in the group every week day and aim to put up a helpful post once a week. Some group members will check out your website and sign up to your free trial. Others will send you private message requests. You should accept all message requests and answer their questions helpfully. When someone comments on any post in a group that post automatically gets boosted to the top of the page. You should use this to ensure your comments and posts get seen by everyone in the group. Most people will go to groups and read the top 4 or 5 posts, so if you've created a great post or offered incredible answers to a post, you want those posts to be in the top 5 for as long as possible. Don't be a douche about it but this means being a little bit tactical about your commenting. 1) Always thank people that comment on your posts but don't do it instantly! Let their comment put you up to the top of the page, then wait until it's dropped outside the top 5, then thank them...... Boom, your up at the top again! 2) When thanking someone don't be shy in asking them a question or making a comment that leads them in to continuing the conversation. A comment conversation can keep you at the top for days. 3) Know when people are getting bored of the post and let it drop.... Usually you can keep a post high for 2-4 days before group members start getting bored of seeing it. If the likes and comments dry up let it drop down and offer something new. 1) Read other responses to the post and comment on them. Tag the commenter as this means they will likely comment again too. Usually something complementary works best as they may well go and like your previous comments, plus, it's just better to be a nice person. 2) Reply to people that comment on your comments. 3) As with above wait until the post drops a little before commenting or replying. It's also worth noting when each group is at its most active. Hence, when more people are seeing, liking and commenting on posts. There's no point in creating a masterful post at midnight on a Saturday as the chances are nobody will see it! Look to have your posts high when people are in the group and interacting. Side Note: Don't get in to arguments! A quick way to put people off you is to get in to lots of silly arguments. While you should always look to stand by your comments and back them up with evidence where possible it won't serve you to get in to arguments. By following this very simple system you will get a consistent flow of new clients for free. Always look out for new groups that you can join and interact with but remain consistent in the ones that are already giving you clients.